I've heard people say for years that the only reason Bill Clinton survived all the trumped-up scandals in the 90s was that the economy was roaring and people really only care about that. Imagine that. 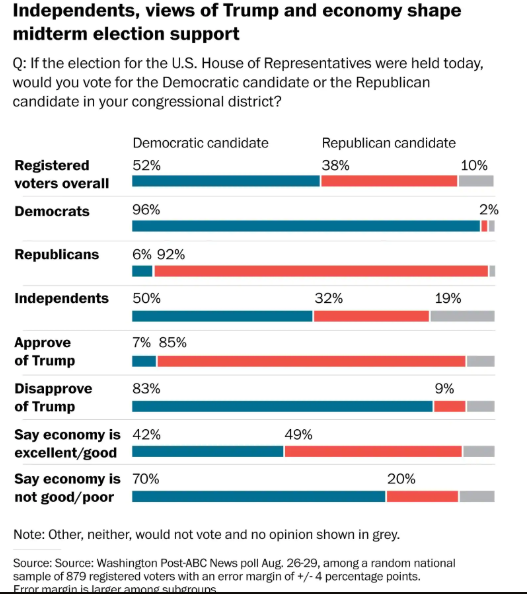 It turns out that GDP and unemployment numbers really aren't the only thing American voters care about. That's not to say that wage stagnation, which is a real issue, or health care premiums and other economic problems aren't salient. Obviously, they are. But Trump is so unpopular on a whole host of issues, most obviously his abject unfitness and the GOP's cowardly unwillingness to confront him, that no passing economic news is enough to overcome the fear and loathing that the majority of Americans are feeling right now. But they'll have their judges. Apparently, that makes it all worthwhile. More poll results on the midterms here.